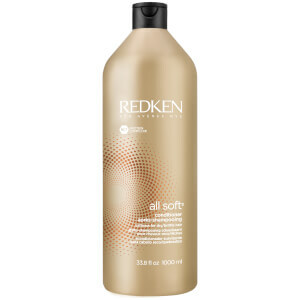 Redken's All Soft Holiday Kit combines everything you need to achieve soft, supple locks. Dramatically transforming the texture of dry hair, the shampoo and conditioner work in synergy to restore and replenish, while the strong hold hairspray locks in style for flawless tresses. A hair softening shampoo infused with Argan Oil to help transform dry, brittle hair. Delivering dramatic results, the restorative shampoo utilizes a smart, multi-targeted delivery system and gently cleanses away impurities to restore softness and shine. Fortified with an exclusive RCT Protein Complex, the formula treats hair from root to tip and helps to renew elasticity and increase manageability, suppleness and shine. Soy Protein adds structure, Arginine maintains health at the core, and Sepicap restores the ends. Dry, brittle hair is left restored and replenished. A moisturizing conditioner infused with Argan Oil to help transform dry, brittle hair. Delivering dramatic results, the restorative treatment utilizes a smart, multi-targeted delivery system and gently softens and detangles while restoring suppleness and shine. Fortified with an exclusive RCT Protein Complex, the conditioner treats hair from root to tip and helps to renew elasticity and increase manageability. Soy Protein adds structure, Arginine maintains health at the core, and Sepicap restores the ends. An extreme high hold hairspray that locks style in place while providing 24-hour frizz control and humidity protection. The formula utilizes positively charged polymers to provide long-lasting hold, and negatively charged polymers to enable movement and body. The hairspray has unique Tri-Mist Diffusion technology, which ensures even distribution and quick drying; never any crunch or sticky residue. Expect long lasting volume and lift. Shampoo: Apply daily, if desired. Massage into lather. Rinse thoroughly. Conditioner: After shampooing with All Soft Shampoo, apply and distribute through hair. Rinse thoroughly. Hairspray: Hold 8 - 12 inches away and mist on dry hair. Layer for added hold. Shampoo: Aqua/Water/Eau, Sodium Laureth Sulfate, Dimethicone, Disodium Cocoamphodiacetate, Glycol Distearate, Hexylene Glycol, Sodium Chloride, Cocamide Mipa, Parfum/Fragrance, Sodium Pca, Salicylic Acid, Benzoic Acid, Guar Hydroxypropyltrimonium Chloride, Carbomer, Citric Acid, Propylene Glycol, Sodium Citrate, Disodium Edta, Sodium Cocoyl Amino Acids, Potassium Dimethicone Peg-7 Panthenyl Phosphate, Sodium Sarcosinate, Benzyl Alcohol, Argania Spinosa Kernel Oil, Arginine, Hydrolyzed Soy Protein, Coumarin, Linalool, Limonene, Fumaric Acid, Hydrolyzed Vegetable Protein Pg-Propyl Silanetriol, Ci 15510/Orange 4, Phenoxyethanol, Ci 17200/Red 33, Tetrasodium Edta, Potassium Sorbate, Sodium Hydroxide (D184463/1). Conditioner: Aqua/Water/Eau, Cetearyl Alcohol, Behentrimonium Chloride, Elaeis Guineensis Oil/Palm Oil, Cetyl Alcohol, Isopropyl Alcohol, Phenoxyethanol, Stearamidopropyl Dimethylamine, Octyldodecanol, Sodium Pca, Parfum/ Fragrance, Citric Acid, Sodium Cocoyl Amino Acids, Chlorhexidine Dihydrochloride, Stearyl Alcohol, Myristyl Alcohol, Potassium Dimethicone Peg-7 Panthenyl Phosphate, Sodium Sarcosinate, Propylene Glycol, Argania Spinosa Kernel Oil, Arginine, Hydrolyzed Soy Protein, Hydrolyzed Vegetable Protein Pg-Propyl Silanetriol, Sodium Chloride, Tetrasodium Edta, Potassium Sorbate (D184536/1) 1129606rk4 Ingredients: Aqua/Water/Eau, Cetearyl Alcohol, Behentrimonium Chloride, Elaeis Guineensis Oil/Palm Oil, Cetyl Alcohol, Isopropyl Alcohol, Phenoxyethanol, Stearamidopropyl Dimethylamine, Octyldodecanol, Sodium Pca, Parfum/ Fragrance, Citric Acid, Sodium Cocoyl Amino Acids, Chlorhexidine Dihydrochloride, Stearyl Alcohol, Myristyl Alcohol, Potassium Dimethicone Peg-7 Panthenyl Phosphate, Sodium Sarcosinate, Propylene Glycol, Argania Spinosa Kernel Oil, Arginine, Hydrolyzed Soy Protein, Hydrolyzed Vegetable Protein Pg-Propyl Silanetriol, Sodium Chloride, Tetrasodium Edta, Potassium Sorbate (D184536/1). Hairspray: Alcohol Denat., Hydrofluorocarbon 152a, Dimethyl Ether, Va/Crotonates/Vinyl Neodecanoate Copolymer, Aqua /Water / Eau, Octylacrylamide/Acrylates/Butylaminoethylmethacrylate Copolymer, Aminomethyl Propanol, Parfum / Fragrance, Hexyl Cinnamal, Benzyl Alcohol, Linalool, Benzyl Salicylate, Hydroxycitronellal, Amyl Cinnamal, Limonene, Citronellol, Cinnamyl Alcohol, Geraniol, Alpha-Isomethyl Ionone, Eugenol (D173659/1). I dye my hair a lot and have caused a lot of damage. I have recently received this as a gift for Christmas, and it is amazing. It smells great and leaves my hair super soft.